These refill bottles feature brilliant water-based, pigmented, acrylic matte colors that are compatible with and match colors available in the Montana Gold spray paint range. In additio nto being ideal for refilling Montana Acrylic Markers, they also offer a wide variety of possible techniques including aribrushing, mixed media and brush applications. The paint can be applied to a variety of surfaces such as canvas, wood, glass, walls and metal. 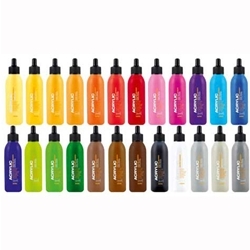 The bottles are transparent for easy color recognition and assesment of remaining content.